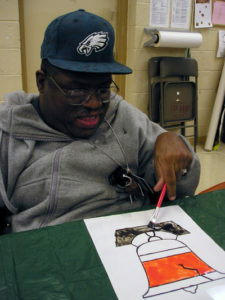 Adult Services works to maximize an individual’s independence and inclusion in the community by increasing vocational opportunities, strengthening independent living skills and improving social competencies. Adult Services programs are available to individuals over the age of 18 with physical and developmental disabilities and a variety of visual, hearing, speech, and learning impairments. Services are provided to adults with cerebral palsy, autism, head trauma, Down Syndrome, spinal cord injuries, mental health difficulties, a diagnosis of intellectual disability, or any condition that limits a person’s independence. In order to be eligible for services, an individual must live in Philadelphia County or designated areas of Montgomery, Bucks and Delaware Counties.